1. Whole grain cereal with a side of fruit: This is an easy go to breakfast that doesn't require much effort in the kitchen (because I'm not about that). Some good examples of whole grain cereals is Cheerios, though they taste like nothing to me. I usually have anything that's Kashi, because you know it's healthy for you and it actually tastes good. 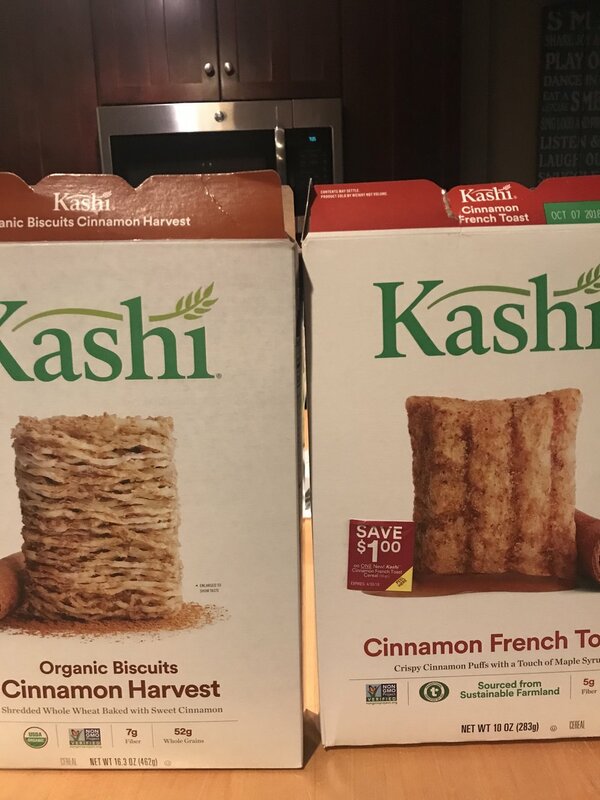 My favorite whole grain cereal to have for breakfast are the kashi Go-Lean cereal, Kashi Organic Berry Fruitful, Kashi Cinnamon French Toast Cereal ( tastes exactly like the regular Cinnamon French Toast), and the Special K Fruit and yogurt cereal. 2. Salads: Salads go a long way for dinners and can fill you up with healthy veggies! For someone like me who isn't a huge fan of vegetables, it can be hard to incorporate them into my day. With salads, I can have all of my favorite vegetables in one plate! I usually go to the Whole Foods salad bar to pick out the different foods. I put lettuce, kale, corn, potatoes, spinach and cheese in my salad! That mixed with Italian dressing makes the perfect dinner! 3. Protein smoothies: Smoothies are a great way to get your daily dose of fruit. My favorite thing about smoothies is that you can put almost anything in their and get creative with what you put in them. I usually put fruits like bananas, strawberries, blueberries and the occasional mango in my smoothie mixed with yogurt, milk and a couple of ice cubes. If you're looking for something more in your diet, smoothies are a great chance to add some protein, and give you a kick start for your day! 4. Snacking healthy: Snack are my literal weakness. That's where I get tempted into having those chips and donuts that are sitting on the shelf. The type of snack and the portion that you have is crucial because if you overload on snacks, it's easy to become bloated and gain those carbs. My favorite types of snacks are the Natural Valley bars, Wheat Thins with Peanut Butter or cheese, yogurt with granola, cut up fruit, fig newtons and cheese and crackers. I've learned of the importance of snacking this year because in my high school, our lunch was from 10:40 AM to 11:30 AM, which not a lunch at all in my book. These snacks will help avoid that time in the afternoon where you've just had lunch a few hours ago, but it's too early for dinner. 5. Water, water, water: Having the daily amount of water recommended is something that is super hard for me. I've tried to carry a plastic water bottle with me around school, but I always forget that I have it and end up not drinking it until I'm super thirsty. The only time I really fill up my water bottle a couple of times is when I'm at the gym working out because I get thirsty super easily. In order to change this issue, I'm going to start off by getting a water bottle to carry around with me in my bag, so I can see it whenever I open the bag. That might help remind myself to drink more water! I am also going to start drinking water with my meals instead of getting other drinks.